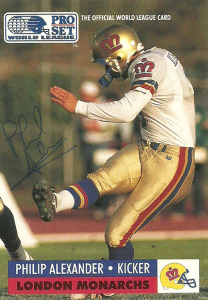 Philip Alexander was one of the WLAF’s Operation Discovery success stories. After playing professional soccer in New Zealand from 1982-1986, and then playing American football with the Farnham Knights of the British Football League, Alexander earned a tryout with Ditka’s Chicago Bears. By 1991 though Alexander was looking to get a further taste of American Football. Things changed when the World League came calling, and Philip joined their ‘Operation Discovery’ program. The idea was that the program was to foster growth of American football in different countries by having teams sign international players to their rosters. 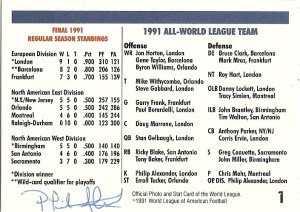 Many of these players had no previous American Football experience, little less NFL experience. (Initially rules were suggested that one international player must be on the field at least once a drive or set of downs. Thankfully this rule was struck down before it even made it to the field.) Still this allowed for an additional four spots on rosters for teams to stash players. 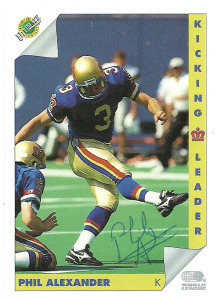 The Monarchs made the most of it, as both Philip and Victor Edubuike were placed on their OD rosters in 1991. 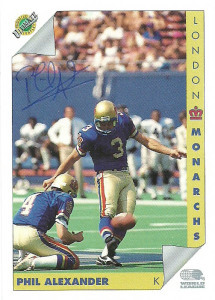 Alexander made the best of his time with the Monarchs and not only earned Operation Discovery Honors as an outstanding international prospect, but also was named First-Team All-World League that season leading the league in scoring with 64 points and going 9/13 on field goal attempts. In 1992, he’d go 9 for 14 on field goals and score 46 points. The league would reorganize after the season, not to be seen again until 1995. Philip returned to soccer (aka football) and eventually moved into the front office. I had been looking to get him for quite a while, but I kept putting it off after I had gotten stung by another long distance WLAF request a few years back. Still I reached out to the Crystal Palace organization and contacted him through email to confirm it’d be okay, and surprisingly I got a response back within a month. Amazing considering that the envelope travelled a grand total of 4,917 miles and back in one piece. This is one of those success stories that has to be chocked up just as much to the UK Royal Air Mail and the USPS, as it was for Philip signing this card.